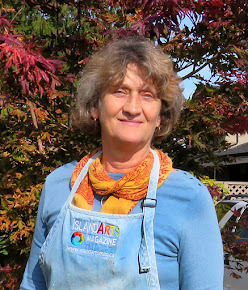 Susan-Schaefer-Fine-Art.ca: What's on Your Easel? 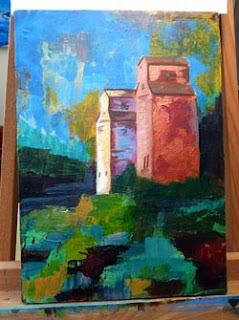 Take a look at what's on my easel! The new year is a good time to go through your "stuff" and clear out what you don't want and finish those projects that you think are worth saving. This canvas already had the beginning of a painting on it that I had started, oh, some 10 years ago. Many layers of gold and copper paint formed the base. Keeping that theme, I painted and scratched and scraped more layers of gold and copper adding a gel medium to give it more depth and texture. Other colours were scraped and brushed on. The elevators just happened along somewhere near the end of the process. Finished piece is 10 x 14". Now to come up with a catchy name. Any suggestions?